Play dough is almost like a staple toy of childhood, and is still enjoyed by many children for good reason! It's fun, it's creative and can be used over and over again. However play dough does have a life span, and replacing it can be costly. 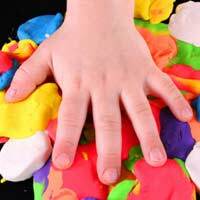 Children have long enjoyed brands such as play-doh, however, making their own play dough will be just as much fun as crafting with the finished product. The alternative of making your own play dough, which may be a lot easier than you first anticipated and much less expensive. The additional bonus to making your own play dough is that the homemade recipe is non-toxic and completely child friendly. However, as the recipe uses a high volume of salt, the dough is still inedible and children should not eat it, however tempted! To make your play dough, you'll first need to find a saucepan, and mix in the flour, salt and cream of tartar together. Make a small well in the middle of the dry ingredients, and then carefully pour in the water, mixing in to create a smooth consistency. At this point you can then add in a few drops of your chosen food colouring, as well as the 2 tablespoons of oil, making sure that all ingredients are consistently combined. The mixture will then need to be transferred onto a medium heat, during which time it will require constant stirring. If you don't stir the mixture enough or have the temperature up too high, the dough will burn easily. You will notice that the dough eventually starts to 'ball', although it may be a bit sticky. However, once the dough has contracted from the sides of the pan and balled, you can then remove it from the heat and leave to cool for up to half an hour. After this time, the dough will be ready for use! Of course, if you want lots of different play dough colours, you'll need to make several batches of dough and add different food colourings each time (taking care to clean the saucepan out each time, to reduce cross colour contamination!). If you are planning on making a variety of coloured doughs, then it might be an idea to cut the quantities in the recipe above in half. Your homemade dough should be fairly easy to clean up after use, and any and as long as it is stored in air tight containers in a cool, dry space, it should have a relatively long life! You can also store your play dough in the fridge to try and get the most 'life expectancy' out of it. However, eventually the play dough will be overworked and you'll need to create a new batch. Although children will happily while away the hours sculpting and building with their new play dough, it does have a few other uses. When left to dry or oven baked on a low temperature, the play dough can be used as building blocks or little homemade sculptures to use with other toys. For instance, if your child has a favourite doll or action figure, the play dough could be used to create small landscapes or accessories. An active imagination is all that is needed, as well a coat of varnish once the dough has dried out! Once children become more adept with using their own play dough, they can start experimenting with sculpting tools, such as blunt knives and palette knives. Play dough is also malleable but firm enough to make craft moulds with. You could easily convert a block of your homemade play dough into a plaster of paris mould, or why not try making your own unique candle moulds? If left in the hands of creative children, the possibilities may seem endless! This stuff worked perfectly, it's so easy to make I can't believe it! Helpful info.You rock! Wow that's so easy and cool. Thanks alot for showing it. Helpful information.